Call and speak directly with only Board-Certified Emergency Physicians who can further establish the care you need. Commitment to respond within 1 hour of being called. We currently average 40 minutes on-site to your home, office, or hotel. Relax and get better in the comfort of your own home. We bring the best Mobile Urgent Care to your doorstep in Phoenix, Scottsdale, and Paradise Valley. Only Board Certified Emergency Physicians evaluate and treat your urgent care problem. Our team of highly qualified doctors brings decades of experience right to your doorstep – with each physician having over 35 years of experience. 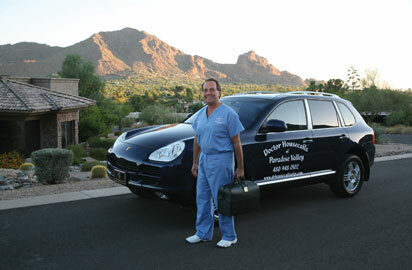 The team at Doctor Housecalls of Paradise Valley takes the time needed for our patients to fully understand their problems and their care options. We treat EVERYTHING an Urgent Care can, and more, including lab testing and I.V. Therapy. I have known Dr. Steven Lipsky for 25 years and consider him to be a friend as well as an excellent physician. Dr. Lipsky has treated me, my family and staff for various urgent medical conditions all with genuine kindness and superb care. His knowledge and dedication to his field make it easy to highly recommend his services to my friends and colleagues. I was suffering from a post-operative knee procedure, so I called Dr. Lipsky. He arrived promptly, diagnosed the situation, and got me under control. What more could you ask for? Prompt, no-hassle, and with results. Dr. Steve Lipsky has looked after me and members of my family since the late 70’s. He has also seen many of my clients, as they pass thru town on their concert appearances, to everyone’s satisfaction. Some of the most famous people in the world have counted on him, my doctor. I cannot offer any better reference than that.